Bugfix - Did not send to net render after cancelling during local rendering. Bugfix - Select All and Check All buttons didn't work properly. There is a great script on (scriptspot.com) that renders max files in batch. Zura suggested me to make that script compatible with BatchCamera, so I've tried to fix it and it looks like it works. Zura went to test it and I've never heard from him since then :) If you feel like you want to test it I'll be happy to provide modified version of MFRender script. I will actually upload that version on scriptspot, but I would like to get permission from original author first. 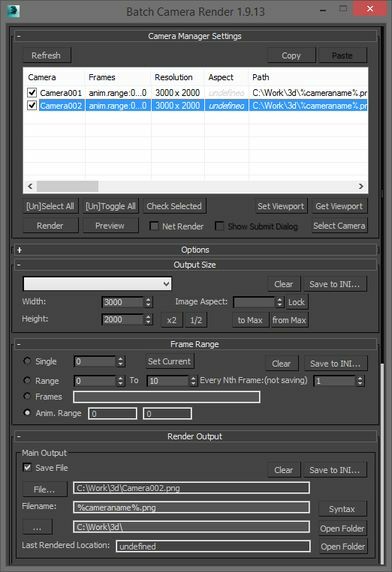 By using these parameters you can specify different regions for each camera in the scene. Get/Set buttons are used to get/set region settings of the current viewport. Values are set as follows: X/Y coordinates of upper left corner and Width/Height of the region rectangle. To keep values resolution independent they are set in percents not pixels. To enable/disable region rendering use Region swatch button. -- render_servers = batchManager.GetServers filter:#group key:"test_global"
Remember to save and run the script using Ctrl+E in maxscript editor to update the script in 3ds max. After that all your silent network rendering jobs will be assigned to that server groups. Also remember that only global groups are supported. To use one or more particular servers you will need to get their indexes in render_servers array. To get that information first make sure script is configured to use all the servers (use fragment above as a guide) then submit any render job and check maxscript listener - there should be the list of all your servers' names. Note the index of needed servers in that list. List the servers using your indexes and array just like this: #(render_servers, render_servers, render_servers). I used 1, 2, 3 here as indexes. That's it. Run the script using Ctrl+E and then run it in regular way, using toolbar button. I hope this little guide helps you to customize your script. I keep getting emails and comments with feature suggestions. Some features look interesting for public version and some look too specific to user's workflow. I decided to list the features that interest me the most and which I think are valuable for public version. If you have some other thing in mind do not hesitate to let me know, this list can easely be changed. And finally message to companies that are using this script in production - feel free to suggest features you need, they can be added to your private version for a small reward. Checkbox Save Vray Ouput was added in this version of the script. You can use it to save Vray VFB output including color correction that was done in VFB window. Tricky part is that this setting is tied with Enable Elements setting. If you have elements enabled and have some path set for the elements then Vray output goes to that path. If elements are disabled then Vray output goes to main output folder. Vray output filetype is the same of main ouput and 'vrayoutput' is added to the end of filename. Other thing to consider is that there is still Save Vray Separate Channels checkbox in the script. If this checkbox is off but Enable Elements and Vray Ouput are both on then you still get all the elements rendered to elements (or main) path. Several people on Scriptspot.com complained about not being able to get render elements on Vray 3 rendered. It looks like I've fixed that bug. At least I am able to render elements. Fajar's modified version of the script inspired me to fix that annoying bug. Thanks Fajar! This site is still under develepment so, please, go ahead and comment on ScriptSpot.com. Some more +-s will also help! New version is ready for download and testing! 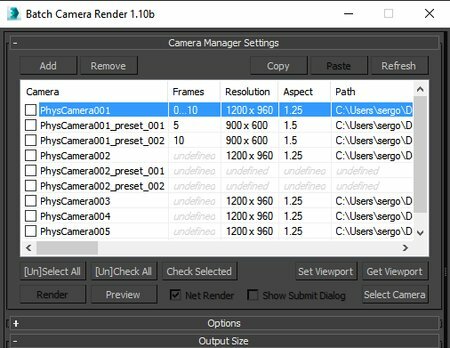 Local rendering of multiple cameras can be cancelled at once. You need to press Cancel button to do this. Pressing Esc button doesn't stop all cameras. Hierarchical ini files with default values. Script is looking for default ini files starting with scene folder and up to root folder. Files located on upper level override values of files located on lower levels, so you can have ini files with certain values common for all projects, then ini file for each project and ini file for certain scene. This script has been offline for quite some time and finally I managed to put together a site and put script's sources on github. I hope it makes easier for you to get recent versions or modify script for your own needs.